Today is Blue Monday, the most depressing day of the year – official. The date was arrived at in 2005 using an ACTUAL FORMULA, which looked at factors including weather conditions, debt level, time since Christmas, and levels of motivation. Many scientists have since derided the formula as 'pseudoscience, 'nonsense' or 'bull crap'… but just think back to whether you jumped out of bed willingly this morning or crawled out reluctantly. Exactly. What do scientists know, anyway? Here’s your weapon against those dark winter mornings when you really don’t want to get out of bed: the Philips Somneo Sleep and Wake-up Light. 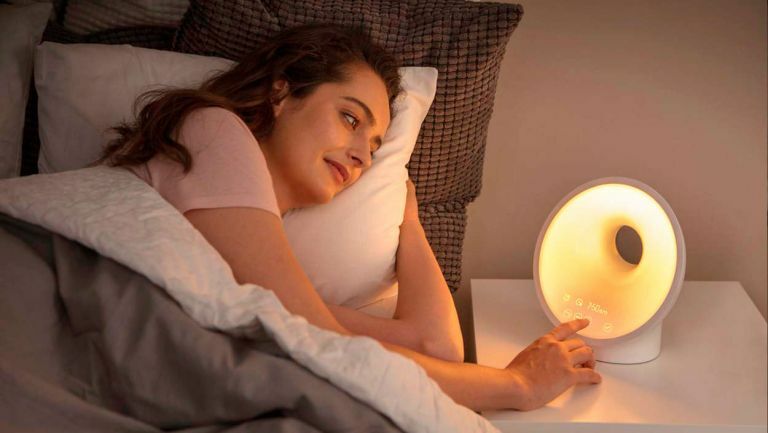 It’s just taken the number one slot in our best wake-up lights guide and it provides a much gentler waking experience than a beeping alarm clock or the sudden change in brightness when you switch on a bedside light, on a dark morning. The Somneo works by emitting a soft red glow a set time before you want to get up – the default time is 30 minutes but you can adjust it. Over the next 30 minutes the light gets gradually brighter through orange and then finally to bright yellow, simulating a sunrise. You can also add an audio accompaniment in the form of nature sounds or your favourite FM radio station if you wish. The result is that you wake up more naturally instead of being jarred awake by a traditional alarm, and you will then leap out of bed, whistling, instead of requiring a winch. The light can also help you wind down at the end of the day, as it features sunset simulation, where the light gradually fades to black. There's a guided breathing mode, too, with seven rhythms of light intensity or sound to follow with your breathing, helping you relax.